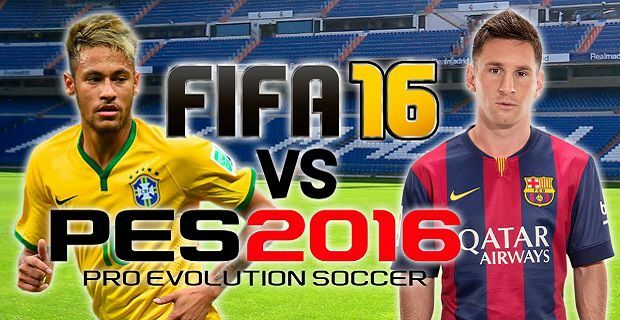 Looking at FIFA 16 vs PES 16 is a natural thing to do because the games makers, EA Sports and Konami, released them into the market at very similar times to stimulate this sort of debate. So which game is better? For a long time Pro Evolution Soccer players believed that they were playing the best and most accurate football simulator while the FIFA franchise was for video game players who didn’t know anything and relied on advertising to decide which games they would buy. That’s not true nowadays because the FIFA franchise has the edge. The 2009 season marked the turning point because the PES franchise didn’t make as successful a jump from the PS2 to PS3 and Xbox 360 platforms. That’s something that Konami have been aware of ever since as their market’s been eaten into by the EA Sports franchise. Konami have used the game’s 20th anniversary to highlight the franchises continued success. The tagline “Love The Past, Play The Future” sums up the angle they’re taking but is the game’s illustrious past relevant? The FIFA franchise exploited the next generation platforms in a way that the PES franchise just didn’t so this is the obvious first choice game. That said, these guys haven’t rested on their laurels. The wild card feature of Women's Football in the game is an obvious attempt to win new female fans but it also adds additional content to the expansive game and shows that these guys are still willing to innovate. Marketing is also a strength with the FIFA franchise. It’s the marketing that brings casual gamers to the franchise but the strength of the gameplay is undoubtedly what keeps them coming back year on year. This is a difficult one to say but features like Enhanced Collision System, which varies how an impact between players affects the players involved, and additional upgrades in Artificial Intelligence really push PES 16 onwards. With FIFA the game makers are perfecting rather than improving a game so small features like no touch dribbling where you can separate the ball from your player while dribbling to lure a defender in before blasting passed him makes for a satisfying addition to the game. As with all games, you need to play both yourself and decide which ones for you. We don’t think you can go wrong with either choice.